Here's why photographers and videographers are going to love the future of communications. Who cares about 5G? You’re forgiven for wondering if 5G is at all relevant for photographers and videographers since all the talk so far has been about the first fifth-generation phones. However, all that talk is misguided. Yes, 5G will make it super-quick to upload a video to Instagram, and it will also make streaming 4K and videos easier on phones, but that's not why you should be excited about it. 5G is not about phones, it’s about super-fast broadband for everyone, everywhere – and that includes on your laptop and on your home computer, as well as your phone. 5G simply means the fifth generation of standards for mobile networks. Using higher frequencies with much shorter wavelengths than 4G, 5G networks will far exceed fibre-optic networks, but wirelessly. It means a new generation of new base stations, of course, and the first (and fastest) 5G connection will be line-of-sight only. That’s called millimeter wave (mmWave) 5G, which will work only over very short distances. However, 5G will go on to use something called ‘massive MIMO’ and so lose that line-of-sight problem, and become as user-friendly as 4G and 5G. What speeds will you get with 5G? We're talking gigabits per second, which isn't something that’s yet been possible on 4G networks; average real-world download speeds are around 22.5Mbps in the UK. Exactly what speed 5G networks will be will depend on each operator; the implementation of 5G is going to see a gradual upping of speeds from between 1Gbps and 10Gbps at the outset to as much as 20Gbps and even 50Gbps in the long term. However, since 1Gbps is going to impress most people, that's where we're likely to start. Is 5G just for phones? No. It's actually not even mostly about phones. 5G is about home broadband. The average home broadband connection now? In the UK it’s around 34Mbps, and in the US it's around 64Mbps. Sure, some UK homes can access Virgin Media’s much faster fibre-optic services, but real-world speeds are very often lower than advertised. So with its minimum 1Gbps speeds, 5G is expected to revolutionize how home get online. With 5G masts in place, a new generation of 5G routers will likely adorn homes' windows to tap into a line-of-sight 1Gbps bandwidth, and then make it available as WiFi to an entire house. Ditto for 5G mobile routers, which will do exactly the same thing to bring your laptop blazing-fast download and upload speeds while on the go. For photographers, 5G will be a step-change. What difference will 5G make to photography? 5G will make it much faster to share and backup photographs, of course. Crucially for photographers – though very rarely mentioned in the 5G debate – is that 5G will see drastically better upload speeds. Expect 5G to be about half as fast when uploading compared to downloading, which is going to make it much easier to share and backup files. There are many other benefits. As well as increasing the total bandwidth, 5G supports vastly many more connections per base station, so you’ll much more easily be able to upload a photo or video while in a sports stadium or at a concert, for example. What difference will 5G make to vloggers and videomakers? In the short-term, 5G is going to be of most benefit to videographers working in 4K. Online video sites like YouTube are already 4K-ready, and 5G is going to make it possible to upload and download 4K video on the go. In the long-term, it’s anyone’s guess how 5G will evolve. When mobile networks increase in bandwidth, they usually get filled with video. That’s what happened with 4G, which made video streaming on smartphones possible for the first time. It also made near-real-time apps like Uber possible. 5G will therefore likely herald a new era of 4K (or, at least, less compressed) video streaming and downloads, and eventually, even 8K videos. It will also make it easier to broadcast 360 videos across social media and the web in ever-higher resolutions. The real-time revolution will also commence, with instant augmented reality data overlays and virtual reality video services likely. Either way, it may be time to make room for a 4K 360 camera in your kit-bag. There's going to be a big issue about data allowance. If we all download the same things we do now, then 5G will merely make things quicker. However, much more likely is that we will all start downloading and streaming more video in better resolutions, which is going to mean an insane leap in how much data we consume. However, what’s the point of being able to download a 4K movie in a single second if doing so maxes-out your monthly data allowance? Telecoms providers are hoping 5G is something of a financial windfall, but for 5G to be realistically affordable, mobile data contracts are going to have to get drastically cheaper. 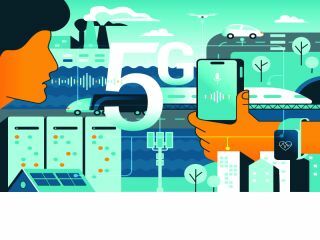 No country will get widespread 5G networks for many years, but the first urban networks are beginning to be being rolled-out. Qatar's Ooredoo was the first in the world to launch a 5G network in May 2018, followed in December by AT&T in the US. AT&T's 5G networks are live in 12 cities (Atlanta, Charlotte, Dallas, Houston, Indianapolis, Jacksonville, Louisville, New Orleans, Oklahoma City, Raleigh, San Antonio and Waco), with seven more to follow in 2019 (Las Vegas, Los Angeles, Nashville, Orlando, San Diego, San Francisco and San Jose. Verizon's mobile 5G network begins to go live in April 2019, starting with Chicago and Minneapolis.V Verizon is also trialing 5G wireless internet for homes in Houston, Indianapolis, Los Angeles and Sacramento. In the UK, Vodafone announced in March 2019 that limited 5G networks are now live in Salford, Bristol, Cardiff and Liverpool, and committed to launching 5G in 19 towns and cities across the UK during 2019. Birmingham, Glasgow and London will be next. Australia, Germany, Switzerland, South Korea and China are among the other countries expected to get live 5G networks during 2019. What else does 5G do? 5G’s will also allow a near-instant one-millisecond latency to the cloud. That’s a key enabling technology for a lot of future-gazing technologies. Driverless cars will need to use it to collate data from sensors, communicate with the cloud, and talk to other vehicles to avoid collisions. As well as allowing a much more dense concentration of gadgets, 5G will mean a lot of compute power will remain on the cloud rather than in gadgets themselves, So expect a new generation of smaller, more power-efficient wearable devices, sensors in everything, and a much, much bigger cloud where data and processing power reside. That’s the so-called ‘Internet of Things’ in a nutshell – and it needs 5G to flourish. Will I need a new 5G phone? Yes, and also a new mobile hotspot, but this is the easy part. Apple is the only brand left that hasn't unveiled plans for a 5G phone so far, with the first few months of 2019 seeing the debut of the Samsung Galaxy S10 5G, Huawei Mate X, LG V50 ThinQ and Xiaomi Mi Mix 3. More 5G phones are expected in 2019 from Sony, Honor, and possibly Apple. What's the future for 5G? But don’t be fooled; 5G isn’t about phones, but rather about building a new era of super-fast broadband for everyone, everywhere. For photographers and videographers sending, sharing and backing up their work, 5G is going to make life so much easier. However, with a real-time data network and instant connection to the cloud will come new creative freedoms and possibilities. Perhaps the biggest change will be augmented reality data overlays. Impressive in its speeds yet unpredictable in its consequences, 5G will change the way we consume media – and that certainly includes photos and videos.